It never fails. 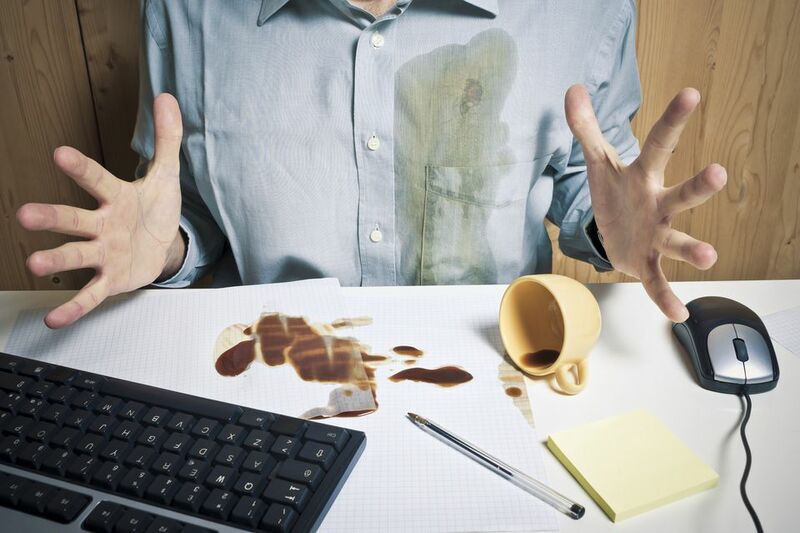 Your biggest client is coming in and you spill coffee on your shirt. Or, your lucky tie attracts a drip from that one last jelly doughnut that you swiped from the break room. Why not be prepared and keep an Emergency Stain Removal Kit handy? One day, you will be thrilled to have it. And, you might even score brownie points if you share it and save the day for your boss! Gather everything into a portable plastic bag or tote so you can treat stains right at your desk or in a quick trip to the restroom. Without causing a big scene when a stain happens, quickly dab, dab, dab. Never rub or scrub at a spill, you may just make it spread or force the stain deeper into the fabric. First, use a blunt knife or the edge of a credit card or ID badge to lift away any residue on the surface. Next, use a white towel (a colored cloth may transfer dye to the stained fabric and make your problem even worse) to blot up any moisture. Don't have a white cloth? Use a slice of white bread to absorb the spill. If it is an oily stain, sprinkle with baby powder and let it sit for several minutes and then lightly brush away. (You can even use table salt if you are at lunch. The salt will help absorb the oil. Back to the stain, after you have blotted away as much of the stain as possible, always spot treat the stain working from the edges toward the inside. This should happen whether you use a stain pen, wipe, plain water or other cleaning mixture. Use a cotton swap to apply any cleaning solution to avoid over saturating the fabric. Keep blotting with the white cloth moving to a clean area as the stain is absorbed. Here's how to tackle some specific stains. These tips will hold you until you can get home and really wash away the stains or get the garment to a dry cleaner. As always, a stain is much easier to remove when it is fresh. There is a laundry myth that you must have club soda or sparkling water to treat a stain because the bubbles lift away the stain. Plain tap water works just as well and is less expensive! Coffee or Tea: Use a white towel to absorb as much of the stain as possible. Dip a clean white cloth or one of the cotton swabs in clean water and spot treat the stain from the outside edges in and then dab, dab, dab with a clean white cloth. Now, treat with the stain pen or wipe. Blot away final dampness with a dry white cloth. Oily Food, Butter or Gravy: Use the dull knife or a spoon to remove any food from the surface of the fabric. Don't rub it in! Dust the stain with cornstarch or talcum powder to absorb oil, then gently brush away. Wet a cotton swab with rubbing alcohol and dab from the outer edges of the stain to the middle. Chocolate: Grab the knife again to lift away any chocolate on the surface. Use the stain removal pen or wipe and spot treat. After a final "rinse" with a damp white towel, wet a cotton swab with rubbing alcohol and dab from the outer edges of the stain to the middle. Lipstick or Make Up: Try a stain removal wipe, dabbing at the stain. Ink: Grab the cotton swabs and rubbing alcohol and work from the outside edges in. Finish with a wipe down with a damp white cloth to remove the alcohol residue. Correction Fluid: Use a sharp edge like a credit card to lift off the residue. Don't rub! Use a cotton swab dipped in rubbing alcohol to remove the stains as quickly as possible. If you have other stains, you can find specific A to Z stain removal tips here that will also give you information about stains on difficult fabrics. Sometimes, the stain is so large or difficult that it can't be removed. Then it is time to pull out the Emergency Stain Camo Kit. Guys, always keep an extra shirt and tie available and a pullover sweater or jacket can hide multiple sins. Ladies, a large colorful scarf can be draped over many stains and the sweater/jacket works well in a pinch. What is the Best Way to Get Hair Dye Out of Fabric? Cranberry Stains on Your Clothes and Carpet?